Climate change is already adversely affecting California and its agricultural sector. Increases in temperature variability, changes in rainfall patterns, and more frequent and exacerbated extreme weather can all be traced back to changing climate. However, according to a recent academic literature review, the brunt of climate change’s effects will occur in the future. These findings describe the threat that climate change poses on Californian agriculture, a $40 billion dollar industry that produces much of the country’s nuts, fruits, vegetables and dairy products. Tapan Pathak of U.C. Cooperative Extension and his team of researchers reviewed 89 different studies or reports to consolidate the most current knowledge about the potential future impacts of climate change on California’s agriculture. The team noted a mean rate of temperature increase since 1895 of about .87 degrees C per 100 years, including a rate of 2.06 degrees C per 100 years since 1975. Not only does this show an increase of average temperatures in California, but it also clearly marks an acceleration of mean temperature increases that bring many adverse effects. Changes in precipitation is expected to be highly regional in the future. The variability of precipitation in California is larger than other nearby states, which indicates more unpredictability in rainfall. Additionally, Northern California is expected to receive higher average rainfall amounts as well as an increased frequency of large storms. On the other hand, Southern California will experience a drier climate with 15%-35% less rainfall by 2100. The most recent drought already gave California a glimpse of what could be ahead. The winter of 2013-2014 was the most severe drought since records were kept in 122, although that could soon be the norm. A warmer climate could also jeopardize the state’s reliance on snowmelt as the biggest source of water. The mean peak rate of runoff between 1956-2007 occurred a whole month before the mean peak of between 1906 and 1955. Warmer temperatures are inducing snowmelt much earlier in the year. Pathak and his team then modeled the effect of changes in climate variables on many different crops. It is important to note that changes in climate variables do not have the same impact across various crops. 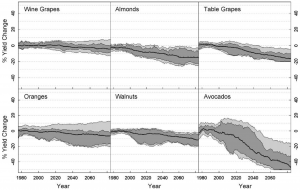 The model predicts that almonds, grapes, strawberries, and peaches are among the crops with the biggest potential adverse effects. The black line shows median projections, the dark shaded area shows 90% confidence interval after accounting for climate uncertainty, and the light shaded area shows a 90% confidence interval after accounting for both climate and crop uncertainty. Overall, a 4 degree C increase in temperature is associated with about a 5% loss in overall crops, although that number can reach as high as 40% depending on region and crop. A lack of winter chill, which has been occurring more frequency, also negatively affects crops. Crops need a winter chill to regulate their growth and without adequate chill hours, crop yields can exhibit delayed foliation, reduced fruit set, and poor fruit quality. The report finds that, by 2100, the lack of winter chill will entirely prevent some main tree crops from growing in California. Ultimately, the literature review brings the independent research papers together to form a clearer, fuller image of the state of California agriculture. While mitigating the effects of climate change is the ideal course of action, some damage to the climate is already irreversible. That makes it even more crucial to work with farmers and ranchers to adapt to changing climate and make their operations more resilient to greater weather extremes in the near future.